The Division 2 keeps what set the original from other similar looter shooters: The Dark Zone. While the original game only had one, the sequel has three distinct Dark Zones, where some of the tensest moments of The Division 2 come from, and where the very best loot can be found. 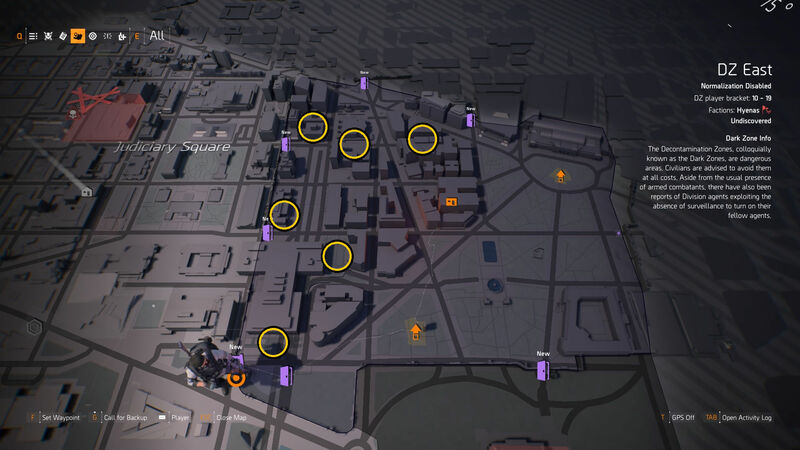 Our The Division 2 Dark Zone guide will walk you through these perilous areas of the map, detailing how to unlock them as well as chest locations and useful tips on surviving and thriving in the Dark Zones. Want to know everything about the various different systems in The Division 2? Head on over to our The Division 2 guide hub to find lots more information about the game. More will be discovered as Agents pile into Washington D.C., so stay frosty. If you’re looking for information about the pre-endgame skills of The Division 2, head on over to our The Division 2 best skills guide for the best skills to unlock and equip, while our The Division 2 best perks guide will go into more detail about the perks themselves and which ones are best to unlock early. For those that just want to get to the endgame quickly, our The Division 2 How to level up fast guide will give you tips on how to do that quickly. Since the Dark Zone is a little alien of a concept for all but the most experienced, this guide will go over how to get into the Dark Zone, where the Dark Zone chests are, what you can find in there, and some extra tips for surviving – whether you want to forge alliances so that everyone can escape with some of the best loot, or break them and take them all for yourself – ya cheeky scamp! In order to unlock the Dark Zone, you’ll need to spend some time completing missions close to the Theater settlement. By the time you have increased the Theater settlement to rank 3, you’ll be given a new staff member named Senait Ezera. Talk to her in the Theatre – she’s downstairs if you’re struggling to find her – before venturing towards the new Dark Zone mission in the map. You will then need to complete a short mission for each Dark Zone, performing a bit of reconnaissance of the area and giving you a taste of the chaos of Dark Zones, while not actually having other players. As you play this mode, there are separate rankings for your performance in the Dark Zone. These can go up and down, depending on how well you perform in there, such as killing enemies, killing other players, or getting away with being a rogue, among other actions. Upon levelling up in the Dark Zone, you can unlock new perks specifically for use in the Dark Zone, via the staff member at the White House. Below is a table with all the Dark Zone perks and the tiers/DZ levels needed to unlock them. I’ve made this table searchable, so I highly recommend that you search “Tier #”, where # is any number from 1-11. DZ Chest 1 – A short distance away from the main entrance point, head north-east towards the Labor Department landmark, making sure to take out enemies in the area. Checking the office building nearby, there should be a wall that’s covered in foliage. The chest is in amongst the rubble. DZ Chest 2 – From DZ East – Bravo Checkpoint, head to the small underground parking lot nearby. There should be an entrance to the parking lot to a floor that has a blue line. Around the corner to the north is where the chest should be. DZ Chest 3 – Around the corner from DZ Bravo Checkpoint – it’s the closest one on our map to the checkpoint – go down the first pathway to the left, and look left past the army vehicle to find stairs. At the top of the stairs is the chest. DZ Chest 4 – From DZ East – Charlie Checkpoint, head a little northeast and head inside the building. You’ll know you’re in the right building if there is a scissor lift next to where the floor slopes. The chest should be around that area. DZ Chest 5 – Leading on from the location of DZ Chest 4, Head down the main road as if you were coming from Charlie Checkpoint and heading east. Eventually you’ll come across a chest next to two park benches. DZ Chest 6 – Entering from DZ Echo Checkpoint, head slightly south and to the west until you find a building that is triangular. Head underground when you can to find a room with lots of PCs. The chest is in the corner of this room. Finally, before we go, here are some changes for the Dark Zone in The Division 2, for those returning from The Division 1. Stats for all players are normalised, meaning you’re not going to outlast someone just because of your stats. This doesn’t apply in Occupied Dark Zones however, which are in the endgame. You can’t accidentally go rogue anymore, meaning that you have to be intentionally shooting at players or performing rogue-actions for it to trigger. There are new rogue actions – such as stealing drops, which can increase your rogue status. Rogue – This is for performing rogue-ish activities that aren’t lethal to other players. Disavowed Rogue – This is for killing other players. Manhunt – This is for killing lots of players and just generally being a bit of a nuisance. Each tier of Rogue will award players that kill you with better items and increases the timer they have to kill you. If you survive, you get to keep the items that would have been awarded to other players for killing you. You can also hack devices to get into the Thieves’ Den. Entering it and hacking the terminal erases your rogue status. Each map has three Thieves’ Dens, each of which has a chance to contain a vendor. When you find a vendor, you can trade Dark Zone items like morphine or MREs for special items. Raising your Dark Zone level will spawn a Dark Zone loot bag in the den. This is a “PVEVP” mode, so AI controlled enemies will also be in the area. They’re a little smarter than regular enemies, but aren’t as bullet-spongy. That’s it for the Dark Zones in The Division 2 so far, but we will be updating this guide with more information on the other two maps in the days to come. For getting the most out of The Division 2 in terms of performance, which could be useful in a unique setting such as the Dark Zones, head to our The Division 2 PC graphics performance guide.